Sometimes 20mm of adjustment just doesn’t cut it. If you’re sharing skis with your significant other or just like maximum flexibility, opt for the Plum 185 binding. With the 40mm adjustment plates built-in, the 185 offers the most fore/aft adjustment of any race binding. 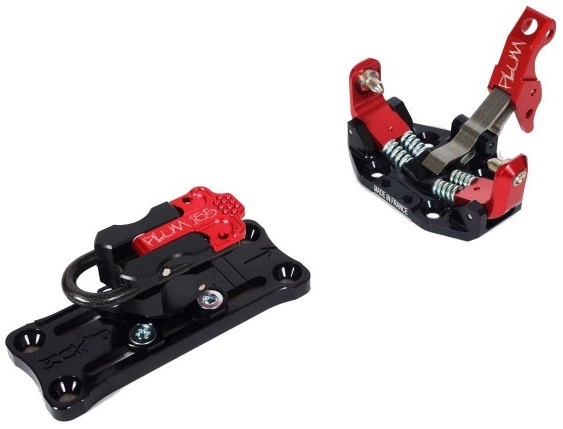 The binding also features a lowered heel tower to keep your ramp angle down. And if you decide to mount the lowered heel without the plates, you wouldn’t be the first. Simple flap covers the durable steel forks when skinning on an incline. Heel tower rotates 360° in either direction to enable flat-on ski mode. Fully ISMF compliant with both locked uphill and unlocked ski modes. Can be adjusted 40 millimeters fore or aft to fit a wide range of boots. Heel pins are only 1.5mm higher than the Plum 135/145 series. Optional attachments accept all standard tech binding crampons.